I literally brushed dust off my laptop when I grabbed it tonight. Lately I’ve been doing lots of things that don’t really involve being on my computer. Two weeks ago, my CrossFit boxed suddenly closed. I had some free passes I was using so I’ve spent the last couple weeks trying to decide what to do with myself. I’m seriously addicted to CrossFit. I’m also playing soccer and will be training for a half marathon though so I definitely can’t justify the cost of joining a new box on top of both of these commitments. I finally made the decision today to sign up for a weekly outdoor CrossFit class. It’s run by CrossFit Calgary and is in the park a few minutes walk from my house. It starts tonight and I’m pretty excited about it. The weather in Calgary has been fantastic, so I’ve been spending a lot less time inside on my computer and a lot more enjoying the outdoors. We’ve been getting back into running more and bought a Frisbee this weekend for sunny days in the park. I even got a mild sunburn on Saturday, which is pretty rare for me! Work has been busy too. I spent most of last week down at geoConvention talking to clients about our software. It was lots of long days in heels, but I actually really enjoyed it. It’s nice to get out and talk to clients, put names to faces, and not be glued to my computer for a few days. On to the point of this post, I guess! 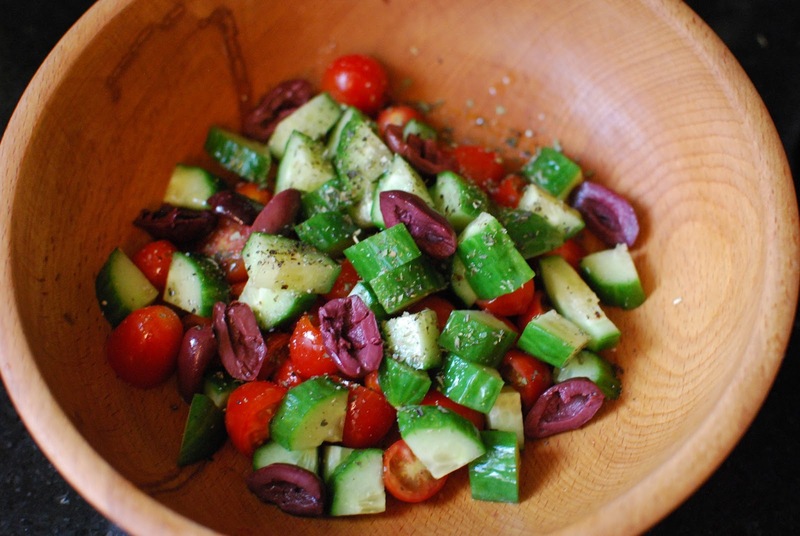 Greek Salad is one of my very favourite salads. Unfortunately, one of the best parts of it is the feta cheese. This month we were making a solid effort to eat Paleo at home so feta was out. I don’t even have any in the fridge right now, which is pretty shocking. Olives are the other delicious piece of the puzzle though, if you ask me. I took a really simple idea from Balanced Bites and edited my Greek Salad recipe a bit. I don’t even know if this counts as a recipe. In a large salad bowl. 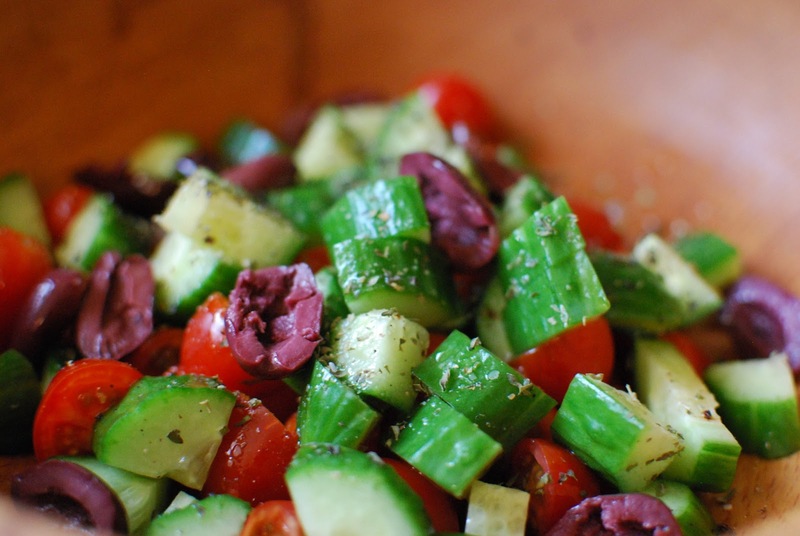 combine cucumber, grape tomatoes, and pitted olives. Season with salt, pepper, and oregano. Drizzle with olive oil.